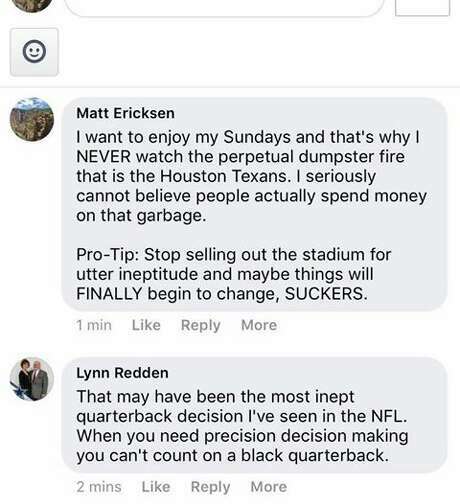 Onalaska ISD Superintendent Lynn Redden apologized on Tuesday for a post he made on the Houston Chronicle Facebook page after the Houston Texans 20-17 loss to the Tennessee Titans on Sunday. Redden wrote, “you can’t count on a black quarterback,” referring to Texans star QB Deshaun Watson. Redden overseas the Onalaska school district which is about 100 miles north of Houston and said he thought he was responding to a private message as opposed to the Chronicle’s FB page. He deleted it once he realized it was public but not before screenshots of it were taken. “I totally regret it,” he told the Chronicle. Redden says he was referring to the overall statistical success of black quarterbacks in the NFL.